American Julian Suri claimed his maiden European Tour victory by four shots thanks to a stunning final-round 64 at the Made in Denmark tournament on Sunday. 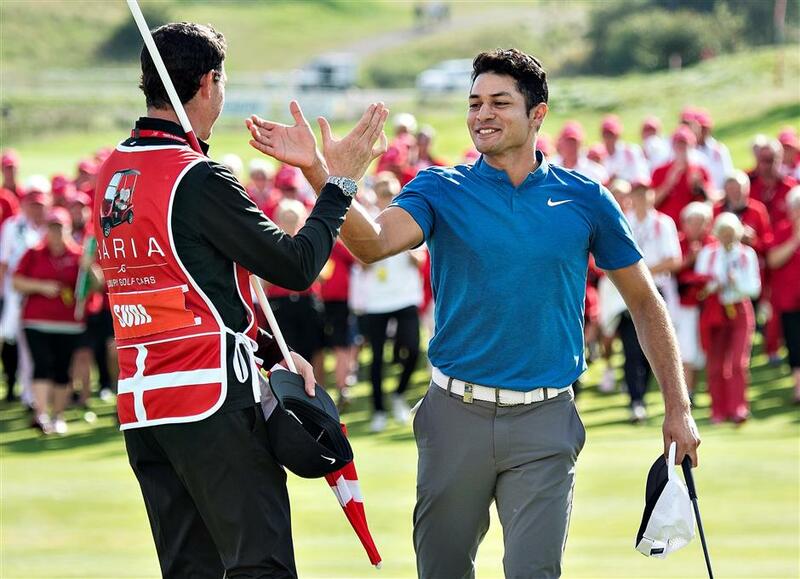 Julian Suri of the United States celebrates with his caddie after winning the Made in Denmark tournament at Himmerland Golf and Spa Resort, Gatten, in Farso, Denmark, on August 27, 2017. The world No. 213 went into the last day one shot adrift of overnight leader David Horsey, but overhauled the Englishman with seven birdies in a bogey-free effort as Horsey carded a disastrous triple-bogey on the final hole. Suri is just the third American to have won on both the European Tour and its second-tier Challenge Tour, after reigning US Open champion Brooks Koepka and Peter Uihlein. "It was a blast out there. Especially in that atmosphere with the fans. It was really cool," Suri told europeantour.com. "I just wanted to soak it up as much as I could. "I feel like my game belongs at the top of the game. This is definitely something I've worked for and kind of expected for a long time." A bogey for Horsey on the opening green saw him slip back into a tie with Suri on 13 under par for the tournament, before his playing partner streaked clear with three straight birdies from the second. Suri, 26, went out in 5-under 31 to open up a three-shot lead in Farso. Horsey hit back on the back nine with a trio of birdies of his own as the final pair went to the 18th tee separated by just a single stroke. But the 32-year-old's hopes of a fifth European Tour win evaporated at the final hurdle as he collapsed to a catastrophic triple, allowing Suri to tap in for par and the title. Two-time major champion John Daly was just three strokes back after the third round, but a closing 71 left the American in a tie for 10th, although it was the 51-year-old's highest finish on either of golf's main two tours in over two years.